Whether you own a vintage Jeep from the days it served as almost exclusively a military vehicle, or you have a modern model with all the luxury appointments that set it far apart from its primitive military roots, The Motor Bookstore has a manual to correspond with your particular Jeep year and model. You can service and maintain Jeeps that go all the way back to the 1940s with volumes such as Chilton's Jeep Repair Manual 1945-1970 and The Jeep Bible 1941-1986 published by The Quellen Company. Find Willy's service manuals, a 2004 Jeep Grand Cherokee Laredo Manual, a 2012 Jeep Wrangler Repair Manual or just about any other Jeep service manual you need to take on DIY maintenance and repair projects. The Motor Bookstore offers a wide selection of manuals by Haynes, Chilton and other highly reputable service manual publishers, and you can usually get free shipping on your Jeep manual orders. Intended for the do-it-yourself mechanic, collector or enthusiast doing a Jeep restoration, they feature step-by-step disassembly and reassembly procedures so you can repair, service or maintain your Jeep like a pro. 101 Jeep Performance Projects: Suspension, Lift Kits, Frames, Transmissions, etc. Fix, Service or Restore Your Jeep! Jeeps are rugged vehicles. From the 1940s models on, these workhorses have performed duty in farms, construction, even war theaters. Regardless of what you scenario you put them in, Jeeps always came through like champs. Of course Jeep has evolved with the times and the vehicle line now includes some of the best SUVs available anywhere, but like with anything mechanical, they need regular maintenance and, from time to time, some service and repairs. We at The Motor Bookstore understand this and have compiled a comprehensive library of repair manuals for Jeep 4x4s, from the 1940s to today, so you can take care of your vehicle properly. From basic maintenance to a complete frame-off restoration if necessary. The manuals by Bentley, Chilton and Haynes cover it all. And our selection does not stop there; we also carry many other tiles, such as the popular Jeep Bible, and the 101 Jeep Performance Projects by Motorbooks. So take a few minutes to explore our collection of Jeep manuals and restoration guides (plus other related books), and order with confidence. Your purchase is protected by our 30-Day Money-Back Guarantee! 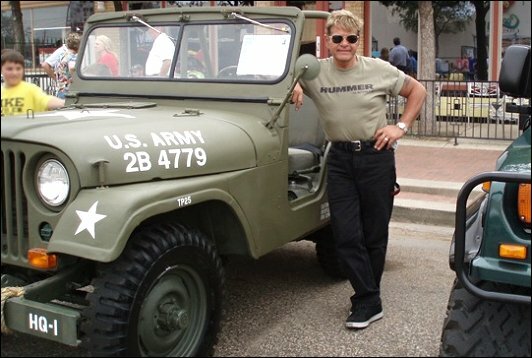 Above: Frankie Olthoff's 1954 Willys M38A1 which he restored himself. Photo was taken at a local car show in Lubbock, Texas, "The Blue Ribbon Rally," where he won first place in the 4X4 Vehicles category. Lubbock, TX.